Reflecting ‘oil-like’ films are not usually associated with resin, therefore, such filled-emeralds can easily be (mis)identified as 'oiled'. The challenge remains here is the observation of ‘faint’ flash effects, and then performing a multi-point microanalysis of a single fissure under FTIR microscope and/or Raman spectrometers. If flash-effect is missed in microscopic observations, the emerald does not go through micro-analyses, and hence no resin-related features will be resolved. Identification of fracture filling in emeralds typically involves a well-established three step criteria – observations under a microscope, followed by spectroscopic (infra-red and/or Raman) analyses, and fluorescence under ultra-violet light (e.g. Kiefert et al, 1999). While observational features mainly depends on the type of filler i.e. whether oil or resin, and their types, the process of filling (whether traditional or modern), and type of illumination used. ‘Traditional’ process refers to immersion of emeralds in a bowl of oil (e.g. Johnson’s Baby Oil) from few hours to overnight, where occasionally warm oil may be used or the bowl containing oil and emeralds is placed under a lamp for gentle heating; whereas ‘modern’ process refers to use of pressure for filling, where heated fillers are forced into the fissure with pressures of up to ~3000 psi. Depending on presence or absence of pressure during fissure-filling, ‘traditional’ process results in uneven filling and thereby reflecting films within the fissures, while ‘modern’ process results in smooth and even filling. Therefore, uneven reflecting films (figure 1, left & right) along a fissure are a common feature in oil-filled stones using ‘traditional’ method, and the same are being referred as ‘oil-like’ films in this article. ‘Modern’ process on the other hand is commonly used for fillers like resins and few oils, such as cedarwood. Infra-red spectroscopy (FTIR) is the most widely used tool to conclusively identify the type of filler, that too, using standard diffused reflectance or direct transmission modes, where oils and resins display distinct sets of peaks. Figure 1: These uneven reflecting films (left) are typically seen in oil-filled stones, using traditional methods, and are being referred to as ‘oil-like’ films in this article; often, these films appear iridescent (right), depending on the illumination, and the angle of viewing. Since the past few months, we at the Gem Testing Laboratory, Jaipur are observing filled emeralds that display uneven films (figure 2), similar to as described above, indicating presence of oil but often with golden reflections (figure 3). When such fissures are carefully rotated and viewed in vertical direction, they display subtle blue and golden colour flashes (figures 4 to 6), weaker than that typically associated with resins (and some oils, e.g. cedarwood); the observer needs to be extremely careful while observing such stones and one can easily miss these subtle flash-effects. Interestingly, such filling effects are being observed in all qualities of stones from low commercial to high commercial, and in various origins. Figure 2: Typical examples of uneven reflecting films in two different emeralds, associated with oil-filling have been observed in resin-filled emeralds at the Gem Testing Laboratory, Jaipur, in past few months, and are an area of concern. Both these emeralds were identified as ‘resin-filled’, after micro-analyses on FTIR. Figure 3: The uneven reflecting ‘oil-like’ films in resin-filled emeralds, as illustrated in figure 2, are often associated with golden reflections (left and right). Figure 4: Filled fissures with uneven ‘oil-like’ films (left) when observed carefully, especially in vertical direction, display subtle blue (right) to golden flashes. Figure 5: Such subtle blue and golden flash effects easily can be missed during microscopic observations, which is an area of concern, because if the observer is unable to note these weak effects, the emerald probably will not go through detailed micro-analyses under FTIR (microscope) and/or Raman spectrometers. 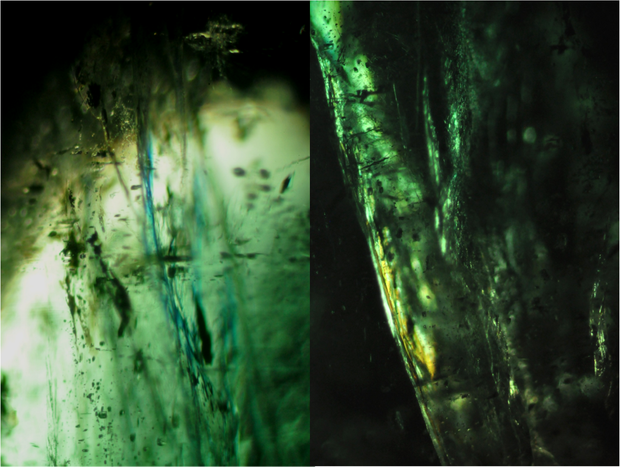 Figure 6: This composite image is another example of subtle blue (left) and golden (right) flash in these resin-filled emeralds, with dominantly uneven ‘oil-like’ films. When such filled stones are analysed in standard diffused reflectance or direct transmission modes of infra-red spectrometer, even in several directions, they display features at ~2854, 2927, 2956 and 3010 cm-1, associated with universal oils, only. However, considering the presence of blue and golden flashes, features associated with resins (or cedarwood oil) is expected, but lack of such spectral features intrigue further detailed spectroscopic analyses. Therefore, a detailed micro-analysis is performed using FTIR, equipped with a microscope, where a single fissure is analysed from several points, although this analyses is a laborious and time-consuming process. 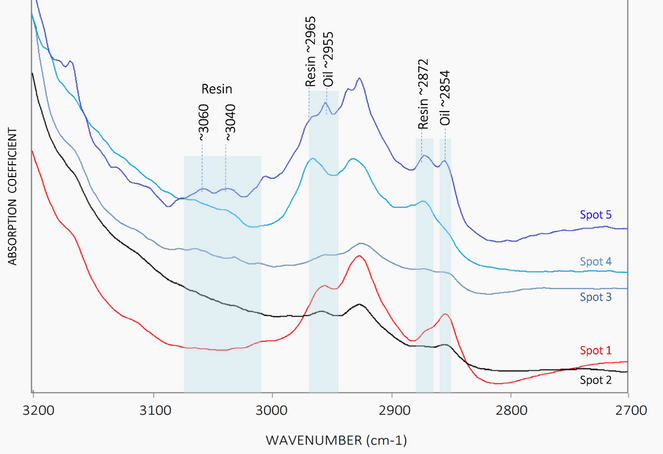 Such multi-point analyses under FTIR microscope reveal two sets of features (figure 7) – one set consists of peaks at ~2854, 2927, 2956 and 3010 cm-1, while the other set consists of peaks at ~2872, 2927, 2966, 3035 and 3055/64 cm-1; the first set of peaks is associated with oils, while second set with resins (e.g. Johnson et al, 1999; Kiefert et al, 1999). In many cases, a confocal micro-Raman spectrometer is also used for performing multi-point analyses of a single fissure. Figure 7: An example of micro-FTIR analyses of a single fissure with uneven ‘oil-like’ films. Note the shift in peak positions, where spots 1 and 2 (red and black traces) display features associated with universal oil, while spots 3, 4 and 5 (blue traces) display peaks associated with resins, such as opticon, araldite, etc. Analyses using standard diffused reflectance or direct transmission modes, reveal features associated only with universal oil (red and black traces), and may result in (mis)identification of the filler. So, what causes such visual i.e. reflective films along with subtle flash effect, and spectral patterns? We don’t have a definitive answer to this, but such effects may be a result of instability or inhomogeneity of the filler; or problem with the filling process i.e. fissure not cleaned thoroughly before filling, or required time, pressure and temperatures not achieved; or the stone has undergone through several generations of filling. To find out the reason for these visual and spectral patterns, we spoke to owners of such stones, and tried to track down the processing line. As per the available information, such emeralds were never subjected to resin-filling process, but, they were ‘only’ immersed in oil. However, non-disclosure of an earlier filling on rough itself cannot be ruled out. On further discussions on processing techniques, some manufacturers revealed that the cutters often apply ‘glue’ or ‘epoxy’ at the opening of fissures to prevent polishing compound (such as chromium oxide) to enter into the fissures and/or to prevent the fissures from further expansion, resulting in splitting of the emerald. On the basis of this information, several adhesives including ‘epoxy-based’ and ‘super-glue’ types, being used in the Jaipur trade were analysed using infra-red and Raman spectrometers for their characterization. Out of the many, only epoxy-based adhesives (e.g. 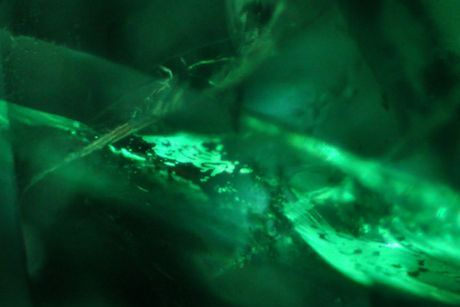 araldite) displayed spectral features similar to those observed in these emeralds, as seen previously for resin-filled stones using opticon, ExCel, Permasafe, etc. Therefore, it may be assumed that the epoxy-based glue applied at the opening penetrates into the fissure due to the pressure created during polishing; and because of lack of proper filling process, it could not fill the fissure evenly, resulting in reflective films. However, this theory is applicable only for few specimens, while considering the depth of filling and the flash-effects, majority of such emeralds appear to gone through several generations of filling. 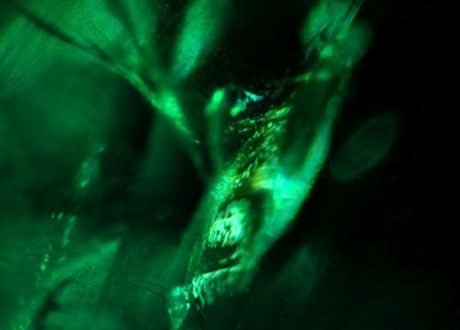 Reflecting films are not usually associated with resin, therefore, such filled-emeralds can easily be misidentified as 'oiled', because majority of filled-emeralds are analysed using diffused reflectance or direct transmission modes of infra-red spectrometer. The challenge remains here is the observation of ‘faint’ flash effects! Once the flash effect is detected, it is equally important to focus the infra-red laser precisely at several points of a fissure producing ‘spot-on’ results; alternatively, confocal Raman micro-spectrometer is also very useful in such analyses. Both types of analyses however become a laborious and time consuming process. In our experience, if flash-effect is missed in microscopic observations, the emerald will not go through micro-analyses in infra-red or Raman spectrometers, and hence no resin-related features will be resolved. Therefore, a ‘resin-filled’ stone may be (mis)identified as ‘oil-filled’! Johnso﻿n M.L., Elen S., Muhlmeister S. (1999) On the identification of various emerald filling substances. 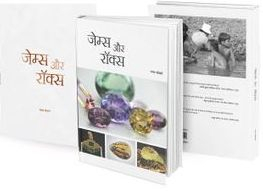 Gems & Gemology, Vol. 35, No. 2, pp. 82–107.